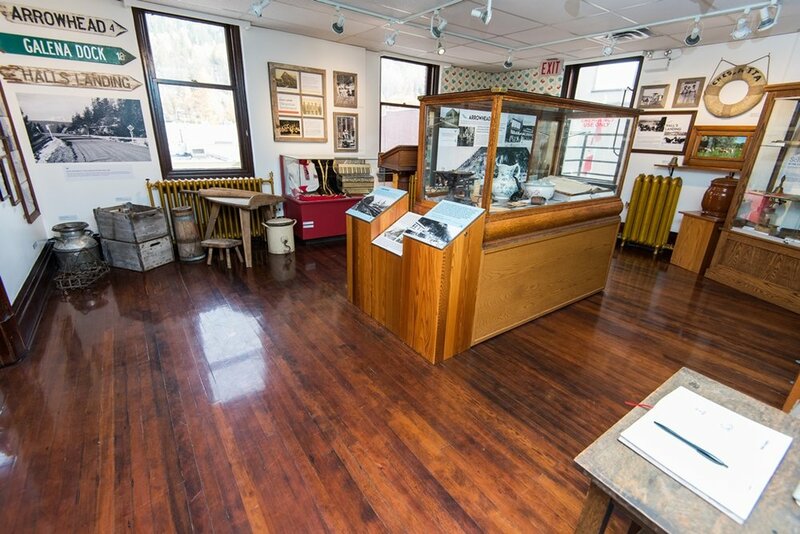 Conveniently located in downtown Revelstoke in a beautiful heritage building, Revelstoke Museum and Archives is a place where all are welcome to explore the rich history of the town and its surrounding region. 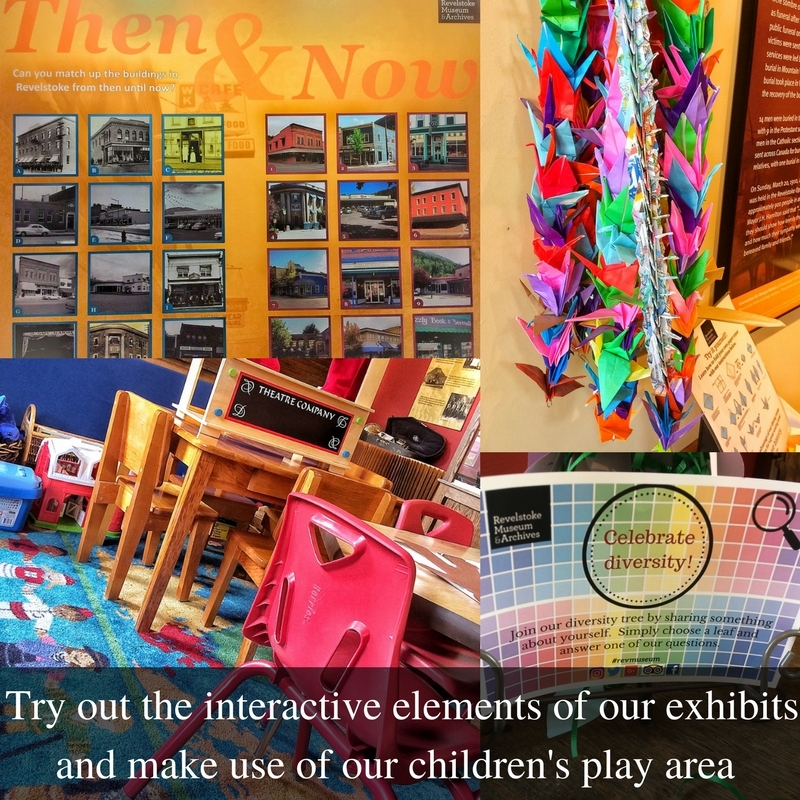 We have two floors of fascinating exhibits, each focusing on different aspects of the area’s history, with several fun interactive activities. We feature a variety of amenities available for our guests to use, including our beautiful Heritage Garden. With free admission for children under 12 and a designated kids’ play area, our museum is the perfect place to explore as a family. We also provide great resources for genealogists and other researchers with knowledgeable staff to help you find what you are looking for. Visit us today and prepare to be surprised by all we have to offer. We are now able to accept donations through canadahelps.org! We have an immense level of appreciation for the support we receive from the public as it allows to continue our operations. Visit our Support the Museum page to learn more about what our donations are used for. 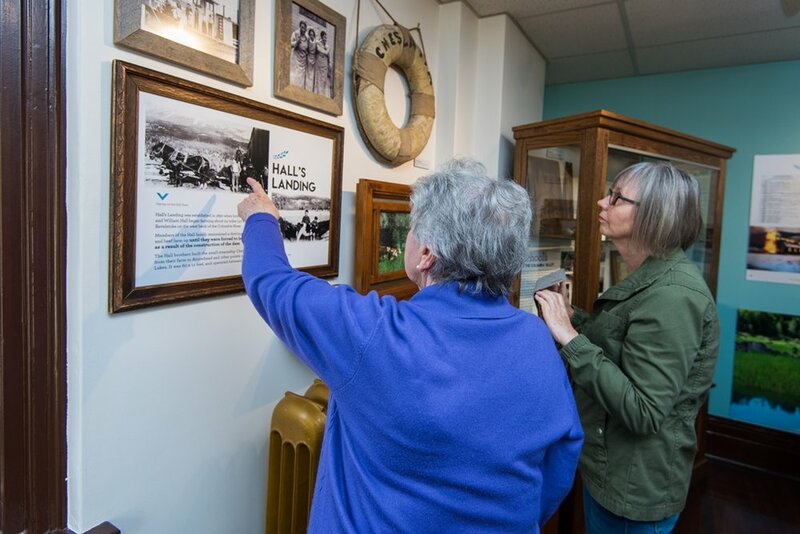 Revelstoke Museum & Archives completed a major storage project in 2018, with the addition of fixed and rolling shelving in the basement of our building. Through this project, we were able to complete our storage reorganization which began in 2013 with the installation of rolling shelving to house our small artifacts. The new project allowed us to properly house all of our large artifacts. We gratefully acknowledge funding from Revelstoke Credit Union, Museums Assistance Program (Heritage Canada), and Columbia Basin Trust. 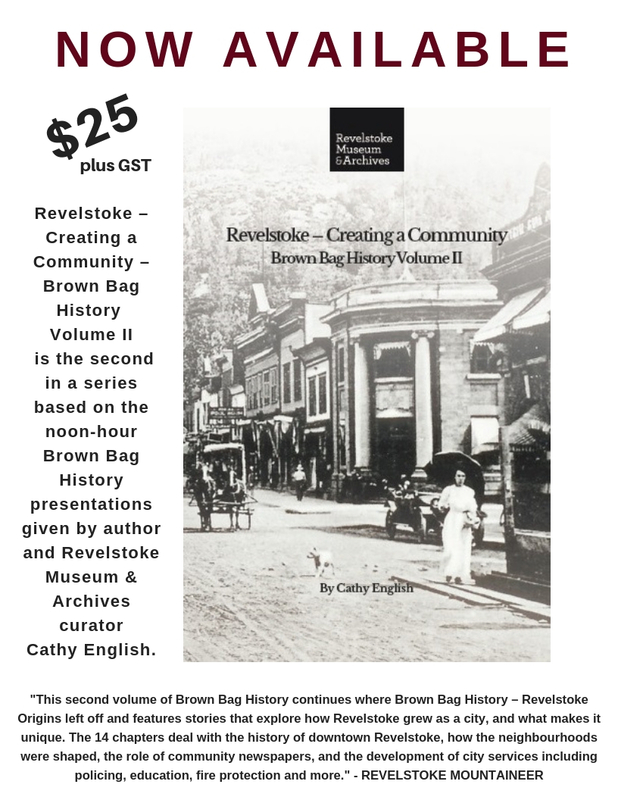 Our new book, Revelstoke - Creating a Community - Brown Bag History Volume II by curator Cathy English is now available in the gift shop. The new book continues where Brown Bag History - Revelstoke Origins left off, and tells the stories of how Revelstoke became the vibrant community that it is today. The 200-page softcover book features several photographs, as well as cartoons by Rob Buchanan. Come in and pick up your copy today, or call to order. 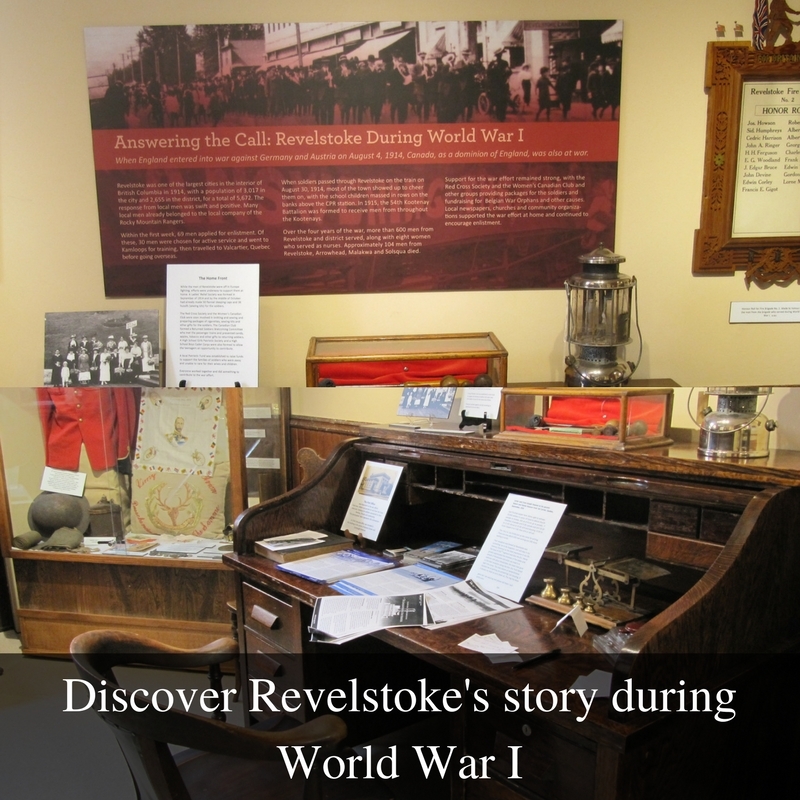 As the Canada 150 project of Revelstoke Museum & Archives, we shared 600 photos on Facebook and at the museum, and asked viewers to choose their top 150. The final gallery is now available on the museum's Facebook page. Click here to see the gallery on Facebook. Prints can be ordered by contacting the museum. Funded by the Government of Canada. Finance par le gouvernement du Canada. We're excited to launch a new type of exhibit for the museum. We've developed a web map exploring the history of the Revelstoke reach, the land between Revelstoke and Shelter bay, in what is now the drawdown zone of the Upper Arrow Lakes reservoir. Follow the link to a story, and series of interactive maps where you'll be able to virtually explore the history of the area through maps, photographs and an interview. Please give us your feedback on the maps. Do you have additional information or photos that we could include? Do you find the maps easy to use? Are there any changes you would like to see? We acknowledge the generous funding from Columbia Basin Trust, through the Columbia Kootenay Cultural Alliance, which made this project possible. On April 13, 2016, in Halifax, Nova Scotia, Revelstoke Museum & Archives curator Cathy English received the prestigious Canadian Museums Association award for Outstanding Achievement in a Science Exhibition on behalf of the Land of Thundering Snow project team.